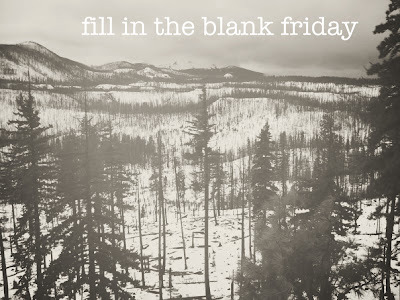 Time for another Fill in the Blank Friday with Lauren. The holiday season is rapidly approaching! I can't believe it's already December 2nd. Snow makes me happy, happy, happy. I love snow - especially when freshly fallen. Sans footprints or tire tracks. The best comfort food to eat when it's cold out is chicken noodle soup. Preferably from Panera. Winter is the best time for crafts, fires in the fireplace, and snuggling up under warm piles of blankets. I can hardly wait for getting our tree, putting up lights, baking cookies with Mom and Rachel (hello, cookie dough!) and hearing what my sister-in-law thinks about one of her gifts. It's probably the one I am most excited to give. When it comes to holiday gifts I prefer to give. I love buying gifts for loved ones, and usually have a hard time keeping my surprises secrets. If I were to rate my excitement about the holiday season on a scale from 1-10, I would say I am at about a 8. I am really excited about Christmas this year and I have no idea why. My eyes even got misty the other day just thinking about cutting down our Christmas tree. Geesh.